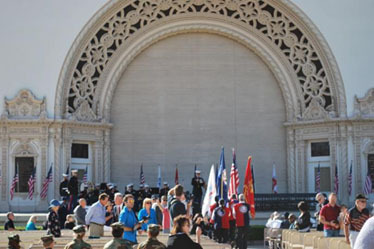 It is a grand, glorious, patriotic day at the Massing of the Colors on November 3, 2012; AIWA was early for the event at the Balboa Park Organ Pavilion. 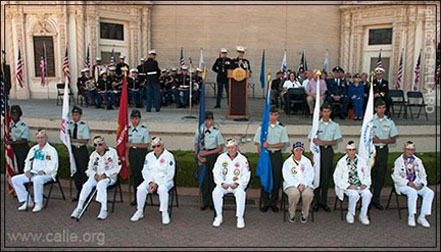 They were there in honor of those military veterans and the thousands of Tribal Americans who have served the nation. They were there in honor of those military veterans and the thousands of Tribal Americans who have served the nation. We serve to educate, inspire and respect by example at this formal presentation of the Colors and our Indian flag is a tribute to our traditional sovereignty. This inspiring patriotic service is a tribute to our flag and to those who are in harms way while serving our country, who have served, and those who have given their lives in the service of our country. 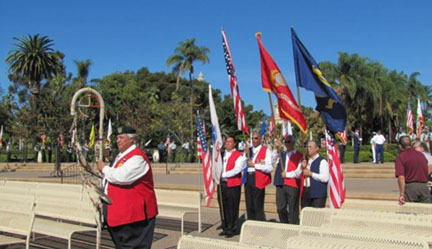 The San Diego Chapter of Military Order of World Wars (MOWW) organizes this yearly event with Color Guards, Band, and community Leaders. The American Indian Warriors appreciate the consideration of Marine Corp Coronel Jack Hawkins for placement at the forefront of the color guard order of entry. Additionally it is always a special occasion to be in the company of Pearl Harbor Survivors. 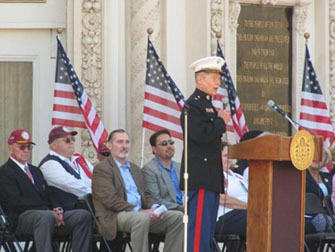 Finally, we were additional pleased that one of our members, Lawrence Butch Strickland USN Pueblo POW, was on stage with the dignitaries and led the audience in the pledge of allegiance.